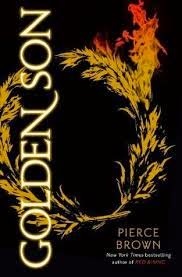 If you love reading The Hunger Games and Ender's Game then you will enjoy reading Golden Son , second book to the Red Rising Trilogy, by Pierce Brown. The moment I saw this at my Lynchburg College library, I picked it up and began reading and finishing it in four days!! 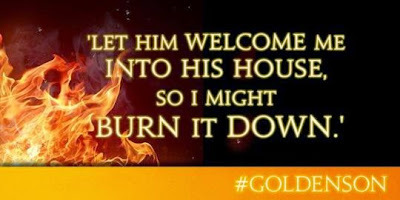 The story picks after the events of Red Rising, first book of the trilogy, where our main character, Darrow, continues to rise the next few years among the Golds, a select group of society elites that stand at the top of their "color-coded" social order. 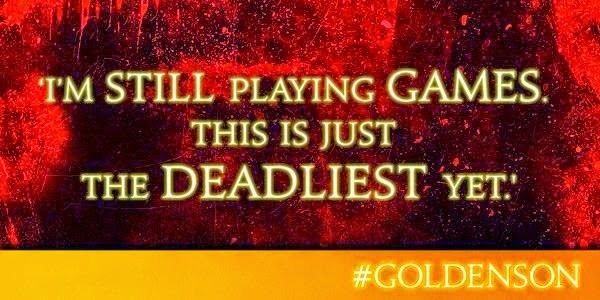 Darrow, who is considered a Red, society's lowest color group which are virtually slaves, has been selected and genetically altered into a Gold by the Sons of Ares, group destined to fight back the oppression of the elite Golds. Darrow is faced numerous times over several raging battles both physical, socially, and morally while he is trying to fulfill is late wife's, Eo, dream but at same time pursuing vengeance against the very man, Augustus, who executed her and enslaved his people on Mars. There are times that even his friends that happen to be Gold can't understand Darrow's moody and self-destructive behavior! But Darrow now faces a hidden danger that is greater than Augustus!! I love how the story is written and the various dynamics happen between Darrow and his friends, family, allies, and his enemies. I checked on Barnes and Noble website for the release of the final book of the trilogy, Morning Star, will be released and it won't be until January 2016 !! AAAAAGGGHHH!! Oh the wait to see what happens! 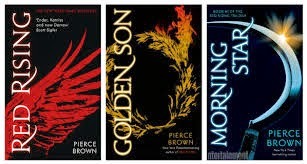 Go either download or read the hardback of Golden Son or read Red Rising first and then read this second book of the Trilogy for those who love to read a story at the very beginning!! I've never heard of these books, I'm definitely going to check them out. Thanks for sharing! No problem!! Look for more future book reviews soon!